The New York County Health Officials new campaign to help New York State residents to be immunized! Visit their website for educational materials, videos, great links, and downloads. Here is a sample video from the ImmuNYze website. What happened when a mother did not have adequate antibody levels and unwittingly infected her newborn? Health Promotion Strategies wants to Keep America Covered! President-elect Donald Trump and the new Congress have threatened to repeal the Affordable Care Act on day one. And, day one is just around the corner in January. That means we need to make our voices heard right now with Senators who will be crucial in this fight. We need to send a clear message that doctors, medical students and those who care about the health of the nation won’t go backward to a time when Americans struggled to get the care they needed. Tell them to protect the gains we have made under the Affordable Care Act and protect the health coverage of millions of Americans. Help make the voices of patients and providers heard. Join the Thunderclap today and share your story! 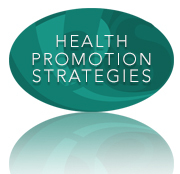 Health Promotion Strategies exists to support organizations whose goal is to make a world of positive difference in the health of the community, your employees, and/or your customers. It is so exciting and such a pleasure to welcome you to our website. We are honored to work with you. Our life has been a passion for improving the health and public health of others and we want to work with organizations and agencies to help you to achieve success in your efforts. By sharing our many years of experience and expertise in working with you on your projects. Health Promotion Strategies’ President and Director Carol Ryan, RN, MPH has expertise in the fields of health, public health and community health and can support your efforts in a variety of settings. Other specialists are also available to support your diverse needs. We can help with management development and coaching, health education for your staff and/or customers or clients, staff mental health education, developing community needs assessments, community health assessments, grant writing, coalition building and maintenance, strategic planning, quality improvement, and more. Like our name, we can assist to develop health promotion strategies for your clientele or your staff. We can organize and run your focus groups, train your staff or your customers in health and mental heath topics, and so much more! We also provide Food Safety Training by our certified trainer for your restaurant or food preparation staff. Other experts are also available to help with a variety of specialty projects. Please visit our Home page to see how else we can be of service to you and your organization.